I made this recipe twice in one week so it must be good. I originally found it when I was looking for a vegetarian main dish/side dish to take to dinner at my dad’s house on Labor Day. My step mom asked me to bring a side so I wanted something veg-friendly that everyone could sample while also working as a main dish for me. This dish fit the bill. Bonus that I could use tomatoes and basil from my garden. At the Labor Day dinner I served it as is. We had a lot of leftovers as usual. My family is funny about food. They will happily eat processed food without question but are always wary of whatever I bring because its “vegetarian”. Benzo and I didn’t mind the leftovers though because we both loved this dish. It made a really delicious and light lunch for us both for the next two days. We ate it as a wrap with lettuce and chopped cucumber on a whole wheat tortilla (pictured above). Highly recommend the wrap version! The first time I made this dish I made it as written using approximately 3/4 cup of small French green lentils (all I had leftover from another recipe) and approximately 1/4 cup of regular brown lentils. The second time I made this dish was last Sunday for a church pot luck. I used all regular brown lentils. I thought it was great both ways. 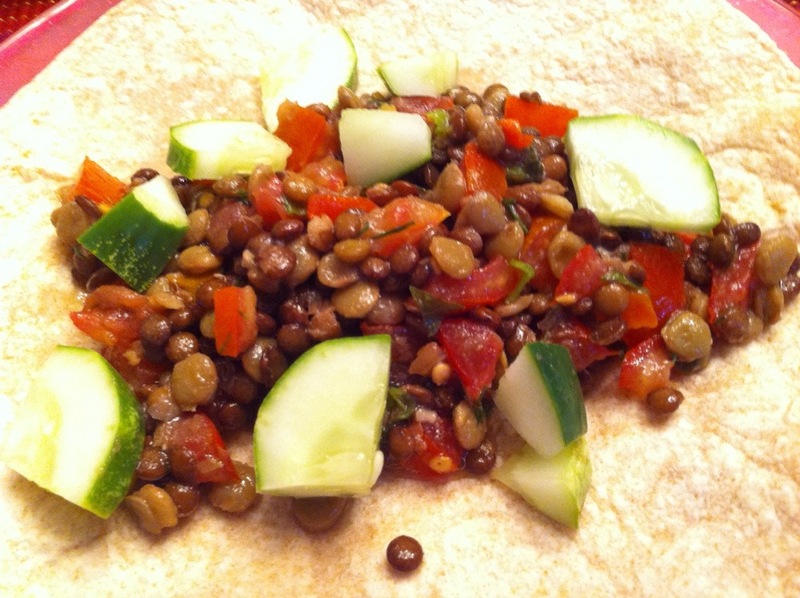 As I made this lentil dish on Sunday I thought how nice it would be to have the leftovers for lunch this week. So wouldn’t you know it there were NO leftovers! I was sad to not have leftovers but happy that the church liked it!